Heavy rainfall and towering cloud heights were the findings when Hurricane Lane was scanned by the Global Precipitation Measurement mission or GPM core observatory satellite on Aug. 17. Lane strengthened to a Category 2 hurricane on the Saffir-Simpson Hurricane Wind Scale. GPM passed above Lane in the Eastern Pacific Ocean on Aug. 17, 2018, at 1:26 a.m. EDT (0526 UTC). 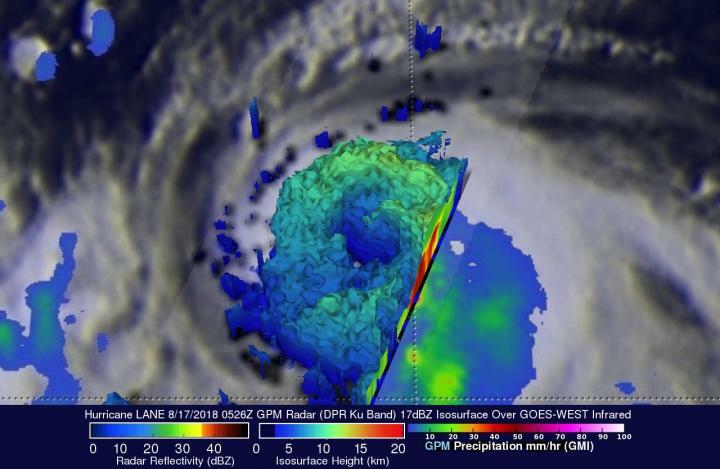 Lane was intensifying and data collected by GPM's Microwave Imager (GMI) and Dual-Frequency Precipitation Radar (DPR) instruments revealed the location of its forming eye wall. Very heavy precipitation was shown by DPR in the forming eye wall. Intense rainfall was also found falling at a rate of over 128 mm (5 inches) per hour in convective storms wrapping around the southern side of the intensifying tropical cyclone. GPM is a joint mission between NASA and the Japan Aerospace Exploration Agency, JAXA. At NASA's Goddard Space Flight Center in Greenbelt, Maryland, GPM satellites radar (DPR Ku Band) data were used to create a close-up view of the 3D structure of precipitation in Lane's forming eye wall. Powerful convective storms on Lane's southern side are also shown stretching to heights above 12.5 km (7.75 miles). At Goddard, a simulated 3D flyby around intensifying hurricane Lane was also created. That animation was derived from GPM's radar data (DPR Ku Band). It showed the location of the forming eye wall and the towering convective storms in the feeder band on the southern side of the tropical cyclone. Lane is forecast to cross into the Central Pacific basin on Saturday. Maximum sustained winds have increased to near 100 mph (155 kph) with higher gusts. Continued rapid strengthening is expected for the next 24 hours. Hurricane Lane is predicted by the National Hurricane Center (NHC) to continue intensifying during the next few days as it moves into the Central Pacific Ocean. Lane, like hurricane Hector, is predicted to pass to the south of the Hawaiian Islands. Lane is forecast to become a major hurricane within the next couple of days.